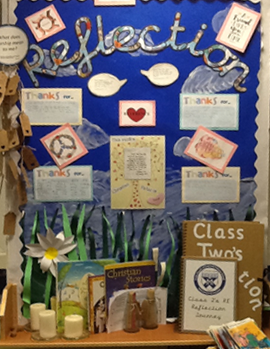 Christian values underpin the life of our school and are integrated into collective worship, embedded into school polices, displays and celebrated throughout school life. As a result, children, staff, Governors and parents know and understand the importance of Christian values. Pupils, staff and governors are kind and caring, support each other and work hard together. As these values are very important to us, they are revisited continually throughout the year. 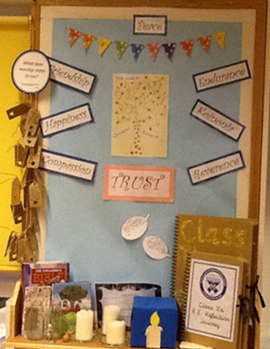 Thursday pupil-led worships are always around these core values. The daily act of Collective Worship is central to the school’s vision and Christian Values. High quality, well planned Worship informs pupils and underpins expectations for behaviour, attitudes and relationships in school. The school community enjoys Collective Worship as it strengthens our close family relationship. We follow a two-year Collective Worship programme. Each half term, we celebrate a new Christian Value. We also follow the church calendar and we celebrate in St Peter’s Church through seasonal services led by Church clergy, members of the local community, staff and pupils of the school. We meet as a whole school for acts of worship every Monday and Tuesday at 3.05pm. On Wednesday mornings all classes meet for individual class acts of worship and reflection. On Thursdays, at 3.05pm, we alternate each week between Hymn Practice/ Reflection and pupil-led Christian Value Worships. On a Friday we come together for Celebration Worship. We regularly visit and hold services in St. Peter’s Church, Croft. On the last Thursday of each half term the pupils lead their Christian value worship in the church. We also have a Christmas Candle Service, Easter Service and End of Year Service in church. Rev. Jenni Lane comes into school once a term to lead a whole school Eucharist Service in school. Children have many places in school where they can go to reflect quietly. We have prayer stations in all of our refection areas where children can share their prayers or, if they would prefer, their prayers can be put into a special box where they are kept private. Prayers are then taken to St. Peter’s Church every half term to be blessed.